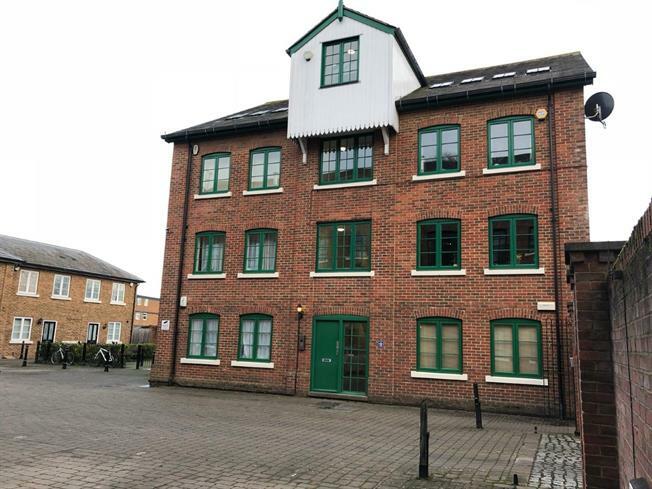 2 Bedroom Flat For Sale in Canterbury for Offers Over £260,000. A superb two bedroom, two bathroom ground floor apartment with courtyard garden situated in the desirable Holters Mill development, a stone's throw from Station Road West! This property is ideal for both investment and residential purposes. Tucked away with secure gated access, the apartment offers allocated parking and offered with no chain. On entry, the communal entrance has secure intercom access. On entry to the apartment, the hallway leads through to two good sized double bedrooms, the master bedroom benefitting from built in wardrobes and fitted en suite bathroom and French doors opening out into the rear courtyard. There is a modern fitted kitchen and an additional shower room with white suite, walk in double shower and tiled from floor to ceiling. The generous lounge has two exposed brickwork chimney breasts, high ceilings and is fantastic open living space, ideal for socialising. The property is extremely deceptive and a viewing is highly recommended to appreciate its qualities. In order to arrange an accompanied viewing, please contact the office at your earliest convenience. Within close proximity of Canterbury City Centre this home is perfect for those wanting the city lifestyle yet so conveniently situated for good commuting links. This property is within easy walking distance of both Canterbury West train station and the city centre. Walking through the historic Beverley Meadow there are wonderful views of the Cathedral and the recently renovated Marlowe Theatre. Taking a short and pleasant walk, you are able to access St. Dunstan's with its many amenities and a variety of restaurants, one of which includes the award winning 'The Goods Shed' farmer's market that is all within a stone's throw from the property itself. The property is leasehold and lease information will be obtained via your solicitor.